January 2008 - New Key web shipmates added in January 2008. Plunkett, Tony 87 - 89; Rarden, Stan 76 - 78; Guinn, Doyle -Plank Owner 65 - 68; Davis, Chris 88 - 91; Keach, Jim 68 - 71; Martin, Malcolm "Mack" Active Duty 87 - 90; McFarland, Randall 79 - 82; Mathies, Eric 88 - Decom; Hill, Mike 76 - 80; Miner, Thomas -Plank Owner 66 - 69; Zimmerman, David 74 - 75. Check Crew List for details. January 11, 2008 - Received an e-mail from Stan Rarden informing us of the passing of Charles "Chuck" Cashion MMCS M-Div Gold Crew 76 - 77. I've added Chuck to the Eternal Patrol page along with Stan's comments and a newspaper article written shortly before Chuck's death. If any of his shipmates would like to add any comments to his memorial, just send them to ssbn657@comcast.net. January 9, 2008 - Just added some new product pictures to the Key Ship's Store. Check out the Polo Shirts, Kids and Adult T-shirts and Denim shirt. January 8, 2008 - Received an e-mail from the daughter of QMCM Thomas J. Stebbins, plank owner and first COB of the Gold crew, that her father had passed in May 1995. I have added Thomas to the Eternal Patrol page along with his daughters e-mail. If any of his shipmates would like to add any comments to his memorial, just send them to ssbn657@comcast.net. My wife Marianne and myself are staying at the Clarion just up the road from the Groton Inn. Little more expense, but less hassle regarding pets. Might be a good idea to inform other Key mates if they are or want to travel with their pet companions. January 3, 2008 - A note from Diane Singleman of the Reunion Committee: I just spoke with the Groton Motor Inn. Only 12 people have so far reserved a room. Can you put some kind of a note on the reunion list page to remind everyone to reserve a room at the motel. It does not get billed on your credit card until you are actually there, so people don't have to worry about adding to there credit card debt. I'm also working on the registration form for the banquet and should have it done by next week. If all goes as planned, Al will also finally get pictures for the ships store this weekend. February 2008 - New Key shipmates added in February 2008. Brower, James 67 - 69; Baker, Rick 78 - 80; Halbert, Kevin 80 - 85; Wheelis, Ted 78 - 81; McMillian, Robert 70 - 73; Stiger, Rick 72 - 76; Zirkle, William 87 - 91; Wells, Jay 78 -81; Balcom, Dave - Plank Owner 65 - 69. Check Crew List for details. February 4, 2008 - "Key Memories" is the title of a new book several shipmates have begun writing about life on the Key and they could use your help. Just click on Key Memories to read all about it. March 2008 - New Key shipmates added in March 2008. Lenover, Bill 71 - 75; Finney, Steve -Active Duty 77 - 85; Rainey, Wilbert 74 - 75; Sturgeon, Tom 90 - Decom; Long, Jeff 89 - 92. Check crew list for details. March 14, 2008 - Shipmate RM Priece Rich has sent in a couple of dozen pictures from the 1972 - 1975 time period of many of his Gold Crew shipmates. Check them out in the 1970s photo area. April , 2008 -New Key Shipmates added in April 2008. Tilton, William "Lee" 81 - 84; Felton, Bobby J. 72 - 75; Spangenberg, Frank A 70 - 73; Calabria, Joe Plank Owner 66 - 70; Weber, Gregory 70 - 74; Howarth, Gerald 74 - 77; Carpenter, William Plank Owner 65 - 69; Peed, Bill 82 - 86; Evans, Thomas Plank Owner 66 - 70; Foster, Daniel 81 - 87; McKinney, Howard 73 - 75. Check Crew List for details. April 28, 2008 - Reunion 08 is over and a great time was had by all. Keep an eye on the web site over the next week for pictures, stories and details of the best Key reunion to date. April 20, 2008 - We received notice of the passing of shipmate Tyler Brayton Gold Crew 1976 - 79. You can read his obituary in Eternal Patrol Our deepest sympathies go out to his family and friends..
April 16, 2008 - I received an e-mail from Mark Persons regarding the death of his brother Bill who served on the Key from 71 - 75 gold crew. Read Mark's comments about his brother in Eternal Patrol. April 14, 2008 - Just added new pictures to the 1960's, 1970's and 1980's photos areas. They were submitted by Bil Hole, Rick Stiger, Greg Weber and Mike Faulkner. Be sure to check them out and if you recognize anyone in the pictures, let me know. Also some new items added to Key Papers. April 12, 2008 - We were recently notified by Lee Tilton, gold crew 81 - 84, of the passing of shipmate Shane Baura, blue crew Electrician in the early 80's. On April 12, 2008 shipmate Daniel Foster sent an e-mail about his time serving with Shane. Read it in Eternal Patrol. April 2, 2008 - USSVI Groton Base just notified us of the passing of Theodore "Ted" Swanson Jr, Plank Owner Gold Crew. Ted passed on March 28, 2008. Click on Eternal Patrol to read more. Our Deepest sympathies go out to Ted's family and friends. May , 2008 -New Key Shipmates added in May 2008. Francis, Bernie 75 - 78; Vannada, Kerry 85; Bailey, Michael 70 - 75; Bartges, Danny 77 - 80; Dunbar, Gregory 79 - 80; Koonce, Alvin 76 - 86; Farmer, Ronald 89 - 91; McKenna, John 86 - 89; Reynolds, Ples 90 - 92, Roske, Wayne 70 - 72. Check Crew List for details. May 5, 2008. - I've placed some more info and pictures of Reunion 08 on the site today. Several shipmates have sent in reunion pictures. This will give those who could not attend an opportunity to get a glimpse of the gathering. May 2, 2008 - Jeff Mason, both crews, 81 - 86 - has sent over 140 pictures of his time aboard the Key. I've placed the pictures on the site in the 1980s photo area as well as in the Halfway Night area. May 2, 2008 - Changes coming soon - I received a lot of good suggestions for additions to the Key web site at the reunion. There will be a Reunion 08 link active this weekend. Also coming within the next few weeks will be new photo links for Rota and Holy Lock with photos of those former Key ports. A new Plank Owners link will be created with pictures and info pertaining to Plank Owners. New items will be added to the Key Ship's Store including a coffee mug and ship's plaque. A Reunion 2010 link will be created with information regarding the selection of the next reunion site. And lastly, I hope at least half of the people that "Promised" to send pictures actually remember to do so. If they do, we would have some terrific new pictures to add to the history of the crew of the Key. June 2008 - New Key shipmates added in June 2008. HolyBee, Michael 77 - 78; Minnick, John 81 - 86; Seaward, Mike 82; Lehman Howard Tom 68 - 71; Sargent, Bradford 87 - 91; Gonzales, Pedro "Pete" 65 - 67 Plank Owner; Griesbaum, Jack 65 - 70 Plank Owner; Blackwell, David 81 - 82; Ubelhoer, Dale 65 - 69 Plank Owner; Graber, Fred 70 - 74; Bieker, Michael 83 - 87. Check Crew List for details. June 27, 2008 - I would like to create a new area on the web site called Home Ports. To do this, I need your pictures of Holy Lock and Rota. If you have some of New London, Charleston and St Mary's that would be of interest, send them along. Also, any pictures of the 1972/73 overhaul in Bremerton would be great. I already have many of the Newport News overhaul in the 80s. June 20, 2008 - I received an e-mail the other day from the daughter of a Key shipmate. She had Googled her father's name and in the list of search responses was a link to this web site and a picture of her father back in the 1970s on the Key, a picture she had never seen before. E-mails like this make doing this web site worthwhile. My name is Kathy Roux (formerly Cortell). I don't have a clue why I did this but just a few minutes ago I punched in my father's name (James Cortell) into my search bar. I was looking through the results when I saw his name with his nickname "Brutus". I clicked the link and there just as plain as day was a picture of my father aboard the Key. I don't remember exactly when he was on the Key, but I remember him talking about it. As a matter of fact I believe that I would go with him to the ship yard when they were in dry dock and go aboard the Key as well. I was young then (born in 73) so my memory could be wrong. My dad moved to California when he retired. I live in Virginia. My daughter is turning 16 this weekend and my dad and brother are at this moment driving across country to surprise her. I understand that the pictures are now archives of the Key and its history, but I would like to find out if there are any more pictures of my father and if there is any way that I may be able to have a copy of the pictures. I am a very sentimental person and to be able to have pictures of my dad when he was in service would be great for the family history as well as a great surprise for my dad. I can't wait to show him this web site. Thanks for all you doing keeping it going. And thanks to ALL the crew members who were on the Key and knew my dad for keeping him safe while I was growing up. June 18, 2008 - We recently learned of the passing of shipmate Mark Helmase. Mark passed on 11/29/94. We do not have any further details. If you served with Mark and can contribute any comments for his memorial, please send them in. 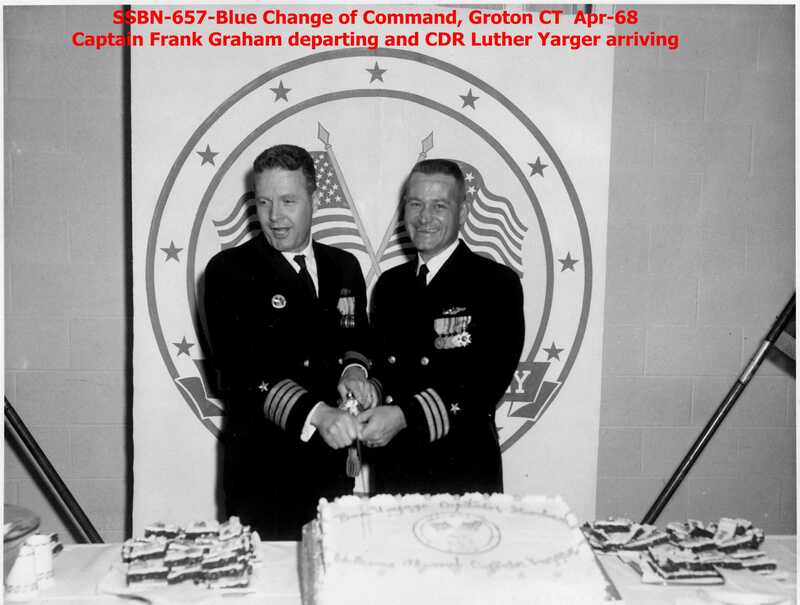 June 18, 2008 - As of today we have a picture and/or history of every commanding officer of the Key except one, CDR H.M. Spruitenburg, Blue Crew 79 - 83ish. If you have a picture or info on CDR Spruitenburg please send it in. The best source is the ship's handbook that is given to each person as he reports on board, so dig through those cardboard boxes and send in a copy. June 3, 2008 - During the 2008 Reunion we toured the USS Providence. I just received this e-mail from Bil Hole saying that the Providence had been awarded the Arleigh Burke Fleet Trophy. SELECTION FOR THIS AWARD IS A REFLECTION OF THE PROFESSIONALISM AND DEDICATION OF THESE COMMANDS. THE CREW OF THE USS PROVIDENCE (SSN 719) IMPROVED THEIR OPERATIONAL PERFORMANCE SIGNIFICANTLY, AND SUCCESSFULLY COMPLETED A DEMANDING SEVEN MONTH ROUND-THE-WORLD DEPLOYMENT, INCLUDING THE EXECUTION OF THREE MISSIONS IN THE WESTERN PACIFIC. THE WIDE RANGE OF OPERATIONAL IMPROVEMENTS MADE BY USS KEY WEST (SSN 722) RESULTED IN AN EXCEPTIONALLY STRONG AND HIGHLY SUCCESSFUL DEPLOYMENT TO THE WESTERN PACIFIC. 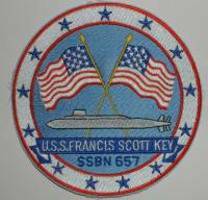 CONGRATULATIONS TO USS PROVIDENCE (SSN 719) AND USS KEY WEST (SSN722) FOR YOUR HARD WORK AND COMMITMENT TO EXCELLENCE. YOU HAVE RAISED THE BAR. July 2008 - New Key shipmates added in July 2008. Edwards, Jerry 72 - 75; Milby, Bill 68 - 71; Latscher, Mike 72 - 76; Mattson, Larry 68 - 69; Benshoof, Mark 77 - 79; Wise, Richard 84 - 87. Check crew list for details. July 30, 2008 - We recently received notice of the passing on July 25, 2008 of Lt. Robert L Sminkey, Plank owner, Gold Crew 1967 - 1970 from his son Bob. Our sympathies go out to his family. Anyone wishing to add any comments to Robert's Eternal Patrol memorial area, please send them to ssbn657@comcast.net. July 18, 2008 - We were just contacted by Dolores Spaulding, the wife of Richard Spaulding - Plank Owner, Cook, Gold Crew notifying us of Richards passing on June 27, 2000. She wrote "He would be proud to be on your web site with his friends." Richard has been added to the Crew List and to the Eternal Patrol area. If any of you guys remember Richard and would like to add some comments to his memorial page, please send them to ssbn657@comcast.net. July 8, 2008 - I just created a new section that gathers the information that has been collected on the decommissioning of the Key in September 1993. Just click on Decomm to read about it. July 4, 2008 - A happy July 4th to everyone. Remember, keep those pictures ands stories coming. August 2008 - New Key shipmates added in August 2008. Norrholm, Leif 67 - 69; Smithhart, Lewis 69 - 73; Dyer, Raymond 91 - 93; Marrah, Thomas 77 - 80; Bryson, Michael 69 - 72; Swisegood, Charles 73. Check the crew list for details. August 29, 2008 - The Key web site hit a milestone today as the 20,000th visitor entered the site. We hit this number in just under two years as I put a counter on the site on Sept 14, 2006. I hope the site brings back fond memories to all and allows shipmates to reconnect. Just recently, a person did a Google search of his high school best friend from the late 1980s. He was very surprised when the results came back with a picture of his long lost friend standing in the missile compartment of the Key. The picture was in our 1990s photo area and had his friends name below it. He e-mailed me and the two were able to reconnect. That is one reason why it is important to try to get names for everyone in the pictures and to have your name on the Crew List. August 27, 2008 - Shipmate Jeff Buss just informed us of the recent retirement ceremony for Key shipmate Mike Jarvis. We want to send along our kudos to Mike for a very fine navy career and to welcome him to the ex-navy life. Below is a copy of the announcement that Jeff sent along. On Friday, the twenty second day of August, Two-Thousand and eight at ten O'clock in the morning at Bldg 14, Naval Support Activity Mechanicsburg, Pennsylvania. A reception will immediately follow the retirement ceremony. Please RSVP to michaeljarvis@verizon.net by Friday, 15 August 2008." August 24, 2008 - Shipmate Cory Curtis recently sent in 112 pictures of the Key from the 1990s and are all located in the 1990s photo area. They show the last missile offload, last Change of Command ceremony in Charleston, transit through the Panama Canal, and a Ceremony at USS Arizona Memorial in Hawaii. I want to thank Cory for taking the effort to gather these pictures and get them to the Key web site for everyone to enjoy. These fill in several holes in the Key's history. September 2008 - New Key shipmates added in September 2008. Cwiklinski, Ronald 69 - 72; Douglas, Michael 76 - 80; Robertson, Charles 83 - 87; Spruitenburg, Fredrik - CO 79 - 82; Horn, Joe 88 - 92. Check crew list for details. September 11, 2008 - We will never forget. "Little science experiment here, let's see if this works. I think I've converted about 40 seconds of VHS tape to an ok MPEG file, it's about 6MB. This is during a test dive during patrol 71 (Spring of 1992) when we did the last blue crew patrol, kind of weird in that we went all the way from Kings Bay into the Med, did a few days alert, got a port call, and then all the way back home. It was strange being mod-alert almost all the time, the "feel" was probably a lot more like being on an SSN because we were transiting deep and fast and coming up a couple times a day to clear the broadcast. Actually it was a lot like late that year in 1992 after we converted back to single crew for decommissioning and were sort of a "slow attack" for a while. An SSN with MTs (missile techs) and missile tubes full of ballast water, if you will. Well anyway I hope this attachment comes through the email ok and plays alright. I figured you being an MT and all, I'd use a small clip showing MCML around Launcher. This is during a test dive and the string in the picture is when we tried that thing where you tie a string athwartships and see if it sags as the boat goes deeper and deeper. Most of the guys in the clip are either MTs, STS (sonar techs), and the guy in the red shirt is one of the MSs (cook). Hope you like it." We hope Tom is soon able to convert more of the VHS for us to see. Click here (Launcher Video) to view 40 seconds of video taken as Tom enters middle level missile from ops. September 1, 2008 - A few months ago shipmate Ken McCracken on this web site, asked everyone to send in their sea stories to him for a book he wanted to write about the Key. Well, Ken has finished the book and he has called it Key Memories. Ken sent me the 79 pages in a pdf file so that all Key shipmates could enjoy the stories. To read or download the book just click on Key Memories. Here is a taste of the book, Page 1. I am a sailor still. small" applies nearly every weekend. and ships belong at sea." sub"ma"rine (sub´mu ren´) ... 2. (n) a kind of warship, armed with torpedoes, missiles, etc., that can operate under water. October 2008 - New Key shipmates added in October 2008. Byrd, Terry 69 - 72; Seago, Stanley 85 - 90; Kinney, Travis 89 - 91; Jones, Marty 74 - 77; Harri, Damon 89 - 92; Lloyd, Jim 86; Blanchard, John 68 - 77. Reinhart, Thomas 79 - 80; Ketch, Robert Active Duty 90 - 93. Check crew list for details. October 26, 2008 - Got a message from Kevin Gallagher 90 - 92 Blue Crew letting us know his new address and that he will be retiring from active duty on November 1, 2008. We wish Kevin the best as he moves into civilian life. October 20, 2008 - We now have 1,056 shipmates listed on the Key Crew List. I've put the number under the listing on the left and will update it every time I add a new shipmate. October 14, 2008 - Just added 23 pictures to the 1990's photo area submitted by Tom Adams - Blue Crew. All you 90's guys be sure to check them out. ovember 2008 - New Key Shipmates added in November 2008. Faulkner, Martin 1969; Cooke, Robert Plank Owner 65 - 70; Stockdale, John 71 - 74; Scroggins, Wade 84 - 88. Check crew list for details. November 13, 2008 - I was just notified by shipmate Bil Hole of the passing of former Blue Crew CO Luther D. Yarger on February 27, 2007. Known as "Liquid Lou" by many that served with him, CDR Yarger was an old-school submariner - the kind they make movies about. Driving around base in his XKE, usually with a good looking woman beside him, made him the envy of many a sailor. To those of us that served under Capt Yarger, we will toast to his life - as I'm sure it would please him very much. Check out Eternal Patrol for details. November 8, 2008 - New Videos! Tom Wagner has just sent in three more videos. UL Ops during a TDU operation, AMR1, and the Torpedo Room. Each 40 second video takes you back in time and lets you hear that very familiar 400 hz hum that lulled us all to sleep. Just click Videos. November 1, 2008 - I created a new section simply called Videos. We currently have two videos to view. One shows the first Trident missile launch from the Key in 1978; the second shows about 40 seconds in the Launcher area in 1992 during a deep dive drill. Check your old files to see if you have any home movies or videos of the Key. It is an easy process to convert them to digital format so that all your shipmates can enjoy them. December 2008 - New Key shipmates added in December 2008. Terrell, Marvin 87 - 91; Wunderler, Frank 91 - 93; Hines, Bruce 86 - 90; Benthall, Phil 78 - 81; Bathalow, Dean 68 - 71; Evering, Edwin Plank Owner 65 - 68. Check crew list for details. December 31, 2008 I don't remember any special activities on New Years while on patrol. All I remember doing is closing out the Launcher log book at midnight and starting a new one for the next year. Now I'm lucky to stay awake until midnight - hoping no one closes my log book. Oh well, I hope everyone has a happy and healthy new year 2009. December 22, 2008 - A merry Christmas to all former Key shipmates.